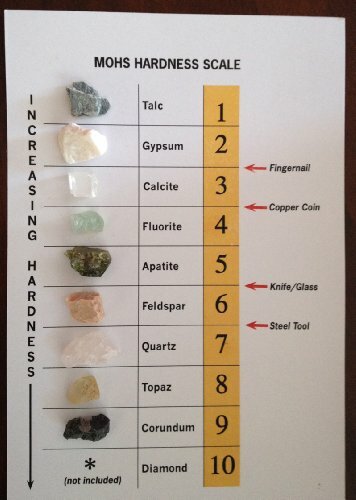 This Moh's Hardness Scale collection is mounted on 5-1/2" x 7-1/8" full color cardstock, and holds nine specimens in their order from the softest (#1 talc) to the hardest (#10 diamond - not included). Indicators on the card tell students what will affect the surface of each of these 1/2"-3/4" specimens. Includes resealable storage bag. Grades 6-12. 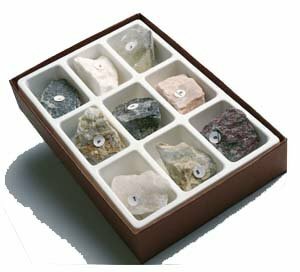 Includes 9 genuine rocks/minerals/gemstones that are one through nine on the Mohs Hardness Scale. The Mohs scale of mineral hardness characterizes the scratch resistance of various minerals through the ability of a harder material to scratch a softer material. It was created in 1812 by the German geologist and mineralogist Friedrich Mohs and is one of several definitions of hardness in materials science. 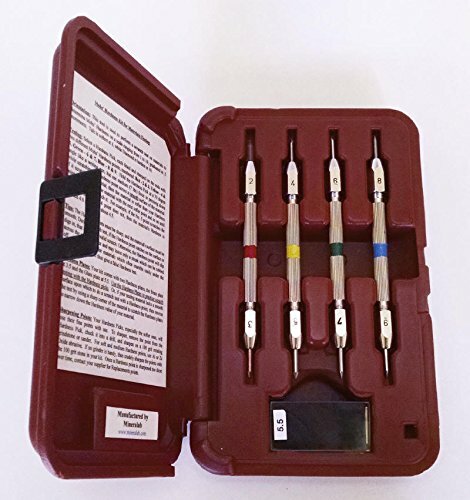 The Deluxe Hardness Pick Set is a tool for Mineral Identification, including a set of Hardness Points for performing a 'scratch test' on an unknown mineral to determine its Hardness under the Mohs scale. 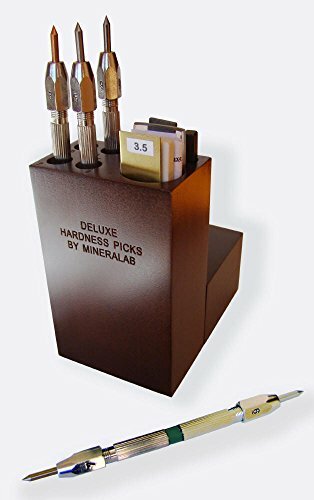 This deluxe kit includes two other mineral identification tests - a Streak Plate for determining an unknown mineral's inherent Color, and a Magnet for testing for minerals such as Magnetite, Pyrrhotite, and Nickel-Iron Meteorites. All of this comes packaged in a beautiful mahogany-finished Wooden Case (Note: This case is hand-made, so some imperfections can be expected). This tool is a lifetime keeper, and makes an excellent gift! 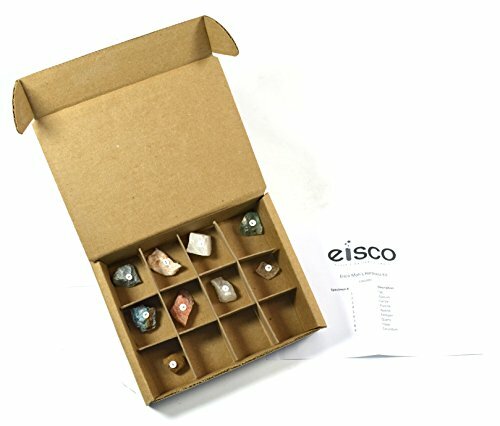 This kit contains nine specimens used as standards on the Mohs Hardness scale. 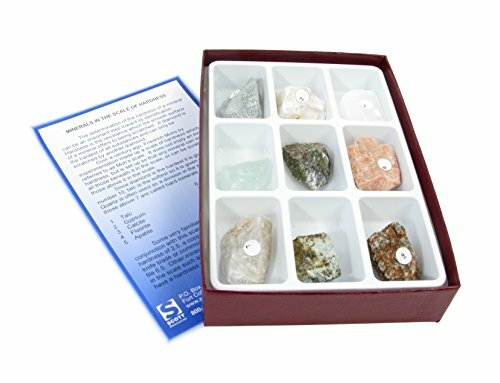 These samples can be used in the classroom or in the field to test the hardness of an unknown mineral sample up to a hardness of 9. They can also be used in classroom activities to determine hardness relative to each other by testing each mineral on glass, copper, and other testing materials. This kit contains nine numbered specimens and a specimen key. Talc, contained in the kit, is chemically similar to asbestos; however, it is structurally different, and harmless as talc. 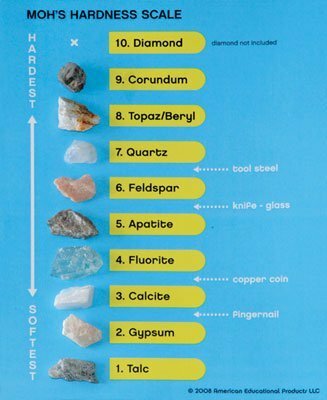 Traditional mohs scale with a small diamond included. Ten specimens, approximately 1" x 1-1/2" (except diamond), number-coded. Grades: 6-12. Ages 11-18. 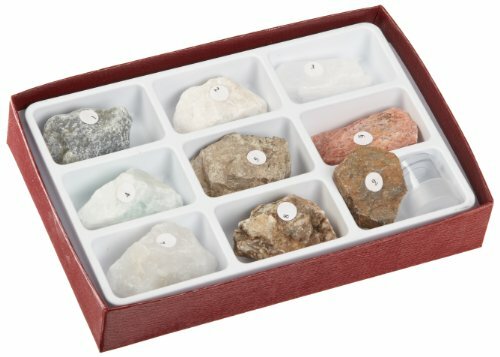 Testing your samples has never been easier than with Mini Me Geology's new Rock and Mineral Testing Kit. This kit is great for home use, classrooms and homeschools. You will learn how to test the hardness using the Mohs Hardness Scale, test mineral streak color and make detailed scientific observations. 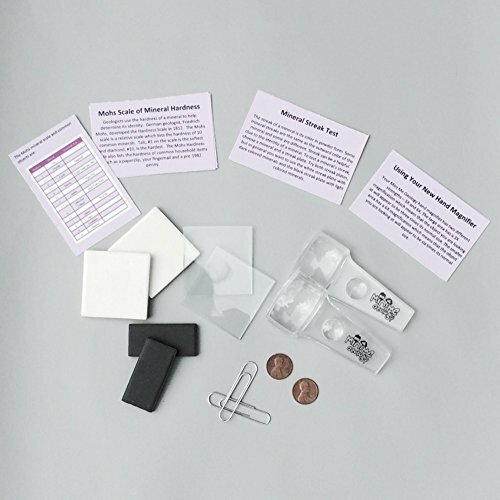 Each kit includes: 2 Hand Magnifiers, 2 Glass Plates, 2 White Streak Plates, 2 Black Streak Plates, 2 large Paperclips, 2 pre-1982 Pennies and, a set of instruction and information cards that provide details on using each item in the kit and how to use the items with the Mohs Hardness Scale. Looking for more Mohs Hardness Scale similar ideas? Try to explore these searches: Dapt Performance Engine Swap Motor, Santa Claus Head, and Maxforce Ant Killer Bait Gel.